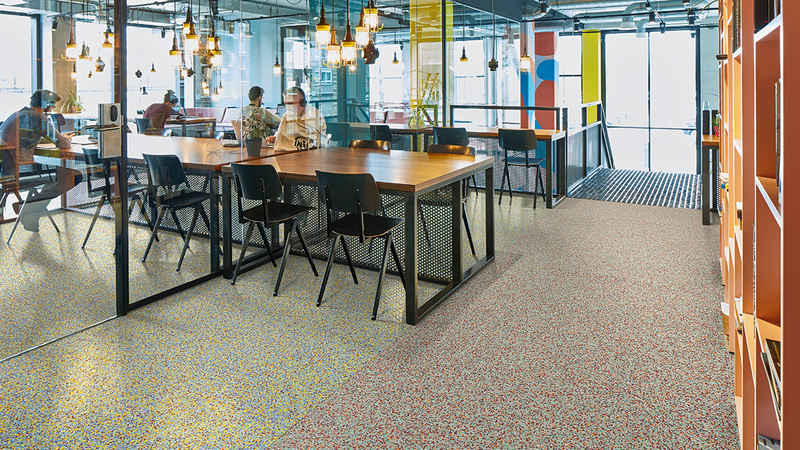 Our new Fabscrap flooring turns unused left-over granules into a vibrant multicoloured floor covering that offers striking design opportunities. 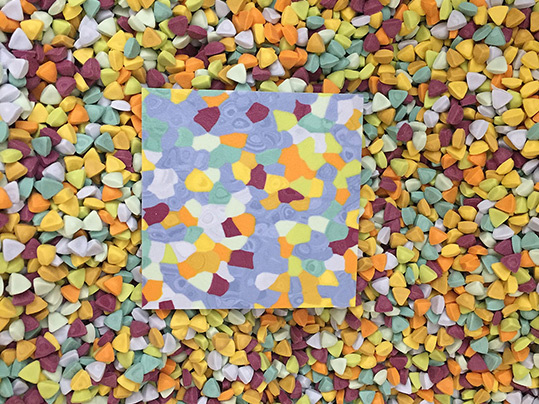 Premium homogeneous quality, phthalate free and truly unique, as each batch of granules is different. 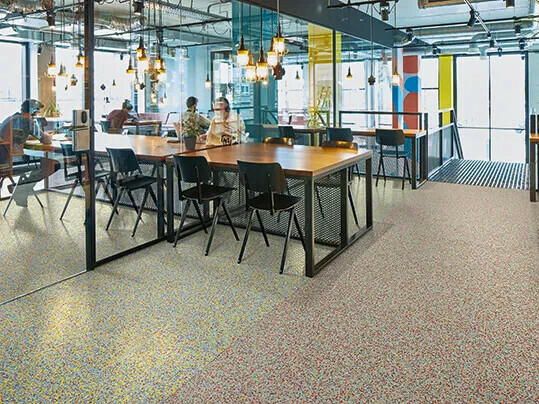 At Forbo Flooring Systems we aim to create better environments. 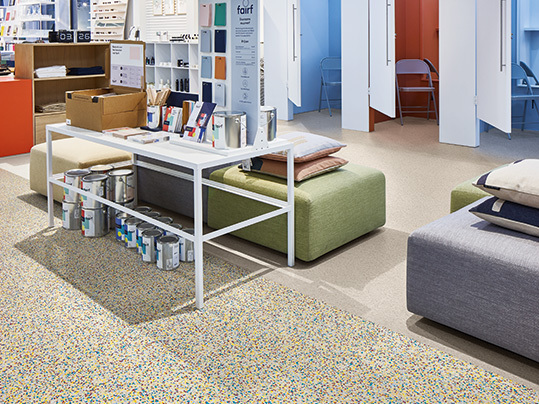 We are conscious about the way we manufacture our floor coverings, reducing, recycling and reusing waste and rest material wherever we can. 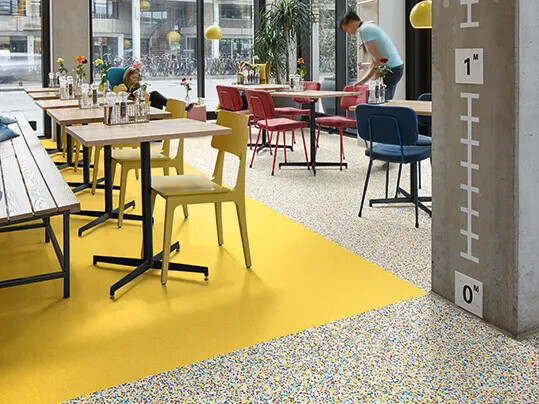 Fabscrap is a homogeneous floor covering that is created by using the rest material of the Sphera production runs, creating a new colourful chip mix that is processed into a unique near zero emission floor covering. 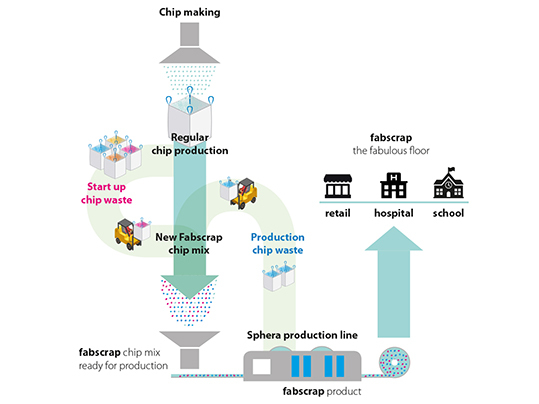 Fabscrap is a fabulous solution for material that otherwise would not be used. 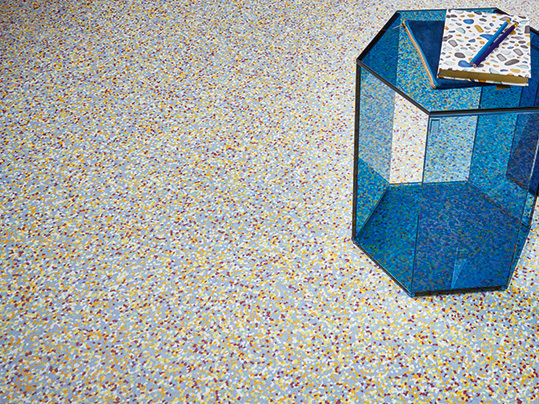 With the excess granules an entirely new floor visual is created that resembles a colourful terrazzo. 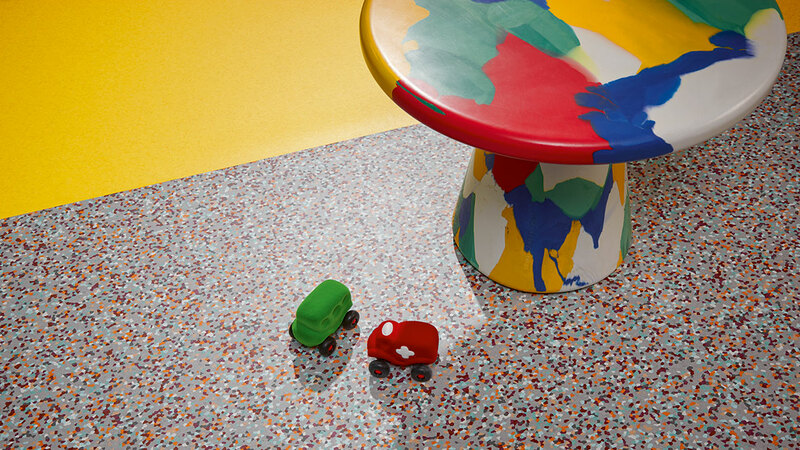 The granules are re-used in a random mix of colours to create a unique and playful floor covering that contributes to a better indoor environment. 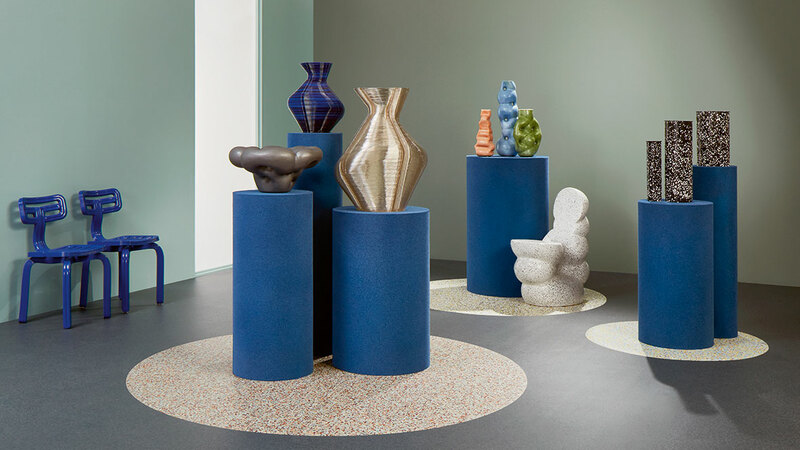 The concept starts with an offer of 4 base shades which form the background of the colourful chip mix: mortar, china blue, white and mid neutral grey. 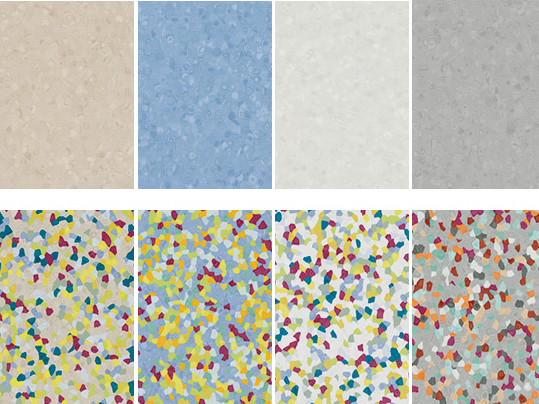 The 4 base shades come from our Sphera Element homogeneous vinyl collection. 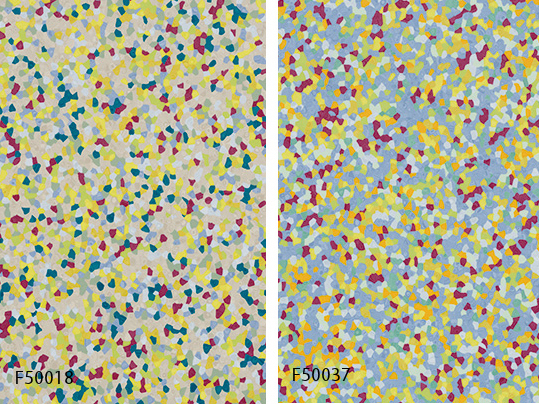 The Fabscrap mix is a random combination of 7 to 8 bright colours from existing Sphera ranges. The colours in the mix vary per production run. Just choose the base shade and the coloured mix on top is a colourful surprise! An exciting opportunity to have something really unique on your floor. Choose your base shade and the chipmix is a colourful surprise! The granule mix varies from batch to batch as it is mixed from leftovers from standard Sphera production runs. This makes each Fabscrap floor truly one of a kind. 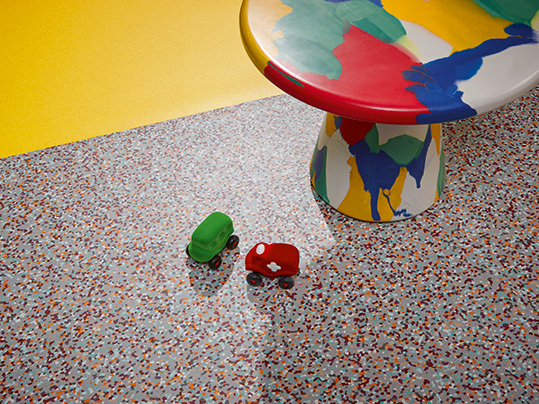 The colourful chipmix in Fabscrap offers endless design opportunities. Beautiful on it's own, eye catching in combination with Sphera Element, whimsical when combined with other Fabscrap colours. Fabscrap offers great design opportunities as it is colourful and unique. Combine Fabscrap with the Sphera Element base colour to create great routing elements. Or let the Fabscrap stand out by using different batches of Fabscrap or mix it with different base colours. Explore the possibilities in the image gallery below and combine & play! Colours in stock: Some projects require quick action. For those cases, 4 Fabscrap colours will be stocked in limited quantities: F50018, F50037, F50000 & F50004. 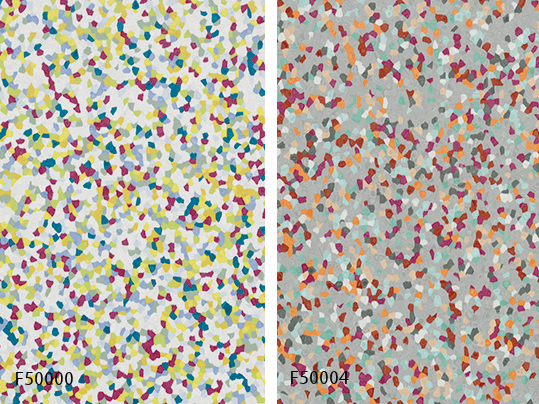 Each background colour is from a popular Sphera Element colour; mortar, china blue, white and mid neutral grey. Favoring another background colour and having a little more time? Just contact us, we are happy to discuss the possibilities. [Fabscrap digital magazine] http://fabscrap.magazines.center/fabscrap/cover/) and get inspired by its possibilities. 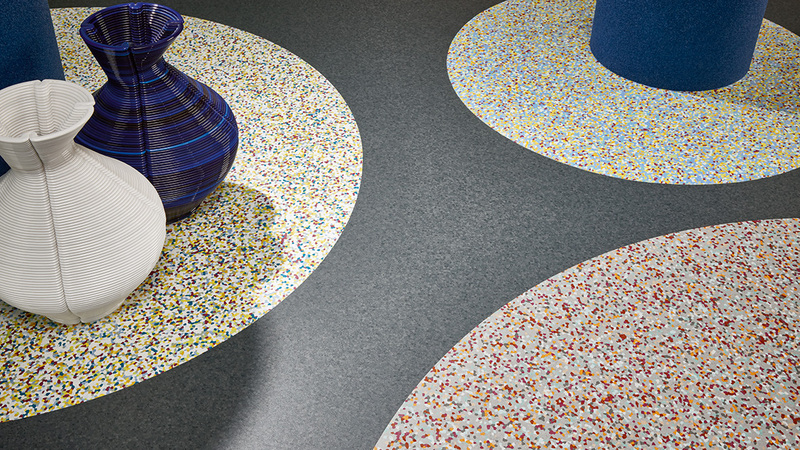 For Fabscrap the same cleaning & maintenance advise can be used as for our Sphera homogeneous vinyl collections.